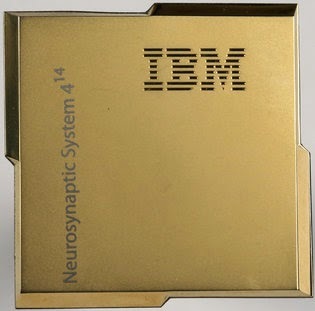 Inspired by the architecture of the brain, scientists have developed a new kind of computer chip that uses no more power than a hearing aid and may eventually excel at calculations that stump today’s supercomputers.The chip, or processor, is named TrueNorth and was developed by researchers at IBM and detailed in an article published on Thursday in the journal Science. It tries to mimic the way brains recognize patterns, relying on densely interconnected webs of transistors similar to the brain’s neural networks. 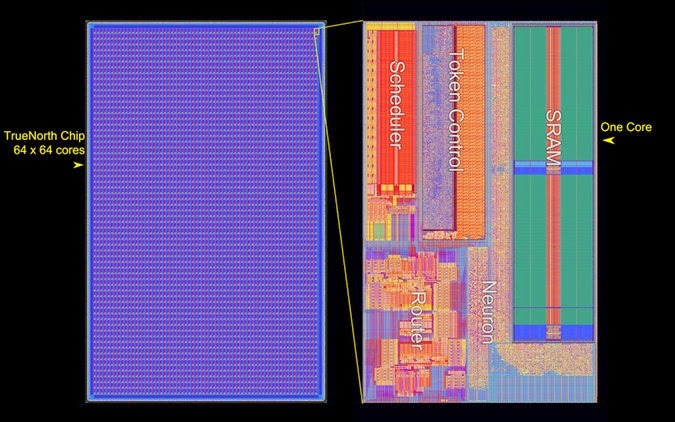 "Today’s conventional microprocessors and graphics processors are capable of performing billions of mathematical operations a second, yet the new chip system clock makes its calculations barely a thousand times a second. But because of the vast number of circuits working in parallel, it is still capable of performing 46 billion operations a second per watt of energy consumed, according to IBM researchers".